When the Las Vegas shooting happened a couple of weeks ago, U.S. media was awash with all sorts of headlines exploring everything from who the shooter was to profiles of victims to pleas for tighter gun control. The stories took the form of traditional news shorts, narrative features, think pieces, first person essays, infographics, videos, and more. All of which, said Elle Aviv Newton, co-founder of Poets Reading the News, traditionally fall short. A Bay Area-based digital publication where, you guessed it, poets interpret current events, Poets Reading the News offers another way to engage what’s going on around us. In response to the Las Vegas shooting, for example, Catherine Strayhall’s “Not The Time” interrogates the refrain often heard from politicians regarding gun legislation. 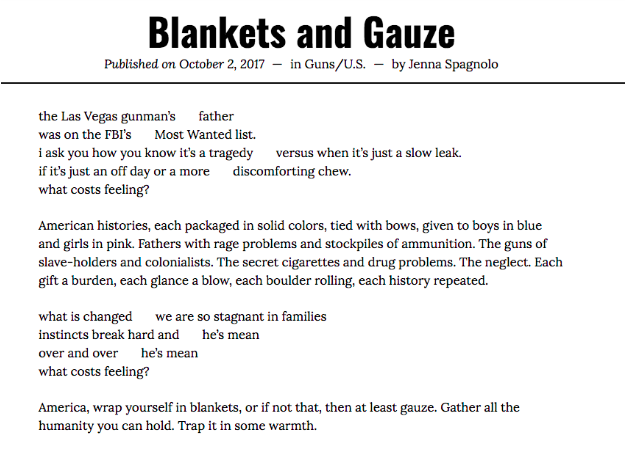 Jenna Spagnolo’s “Blankets and Gauze” offers another perspective, one that is at once haunting and healing. Spagnolo is the other half of the duo that leads Poets Reading the News. Spagnolo, an avid consumer of news and child of a journalist, wanted to fill a niche that wasn’t being explored. With traditional journalism easily accessed from every device, they said, the amount of information coming at audiences from all angles is often on overload. After the Orlando shooting at PULSE nightclub in 2016, poet Maggie Smith’s “The Good Bones” made the rounds on social media. In the poem, Smith assumes the role of real estate agent: “I am trying/ to sell them the world. Any decent realtor,/ walking you through a real shithole, chirps on/ about good bones: This place could be beautiful,/ right? You could make this place beautiful.” It perfectly captured the anxiety of the year—but also the resilience, and how we as a country could move forward. Newton, a self-professed news junkie and bibliophile, started seeing one way poetry and journalism could be linked while living in Bangkok, Thailand between 2013-2016. Newton was part of a poetry circle with expat writers. When protests that shut down entire areas of the city began happening, and a successful military coup occurred, they started writing about it and sharing. Soon, the only English news she and and her writer friends were receiving on their cell phones was poetry and headlines—a combination Newton found powerful. When she returned back to her home in Oakland, California, she reconnected with Spagnolo, who was active in Oakland’s open mic scene. So far, since the inception of Poets Reading the News last year, the site has had 75 contributors—many who are journalists, journalism professors, or former journalists—with readers throughout the U.S. as well as Australia, South Africa, Nigeria, China, and Germany. Image from “Colours from Chibok” poem. Photo credit: Michael Fleshman. Poems dive into local issues such as being stuck during Hurricane Harvey and addressing DREAMers, and global issues that may not be on the radar such as the recent environmental disaster at India’s Bellandur Lake and the continual missing Chibok girls from the Boko Haram kidnapping in Nigeria. For Spagnolo and Newton, having an international focus is important, as well as abiding by journalistic standards through fact-checking each submission. They tend to publish different voices exploring the same topic, especially if it’s controversial or sensitive, and their guiding philosophy is to lead with kindness. You’ll never see poems promoting hatred or prejudice. They also aim to keep up with the pace of the news cycle—unlike typical poetry journals they respond within a day—and links to articles at the bottom of each poem provide greater context. This makes poetry different from journalism, Spagnolo also said, because it can touch upon many issues at once. Geoffrey Philp’s “Oya Awakened” is about experiencing Hurricane Irma but also alludes to the African slave trade, with further reading on how unpaid prison labor is being used for clean-up. Exploring these layers of dimension is something Poets Reading the News takes seriously. Every few months in the Bay Area, they host events to engage a wider community. A day before the presidential inauguration, for example, they convened people to create an out loud, collaborative group poem. In June, “Believe the Hype: Poetics of Propaganda” combined art, spoken word, dance, and community discussion to dissect how language influences thought. Participants break out into facilitated group discussions about bridging ideological divides and the impact of the media for “Believe the Hype: Poetics of Propaganda” on June 17. Photo credit: Joseph Silber. As Poets Reading the News is coming up on its one year anniversary—and celebrating with their “This Is Not A Reality Party” fundraising event—the pair is looking to how they can dedicate themselves to the project full-time and expand their team to include interns and a board of directors. Eventually they’d love to host a podcast, and take Poets Reading the News on the road. But their first big project is publishing themed books featuring multimedia prose and poetry that explore topics such as political propaganda, race, climate change, gender, war, and terrorism. Their ultimate goal, however, goes beyond the confines of the pages and screen.